해발 740m 폭포, 높이 약 88m의 웅장한 폭포로서 금강산의 구룡폭포, 개성의 박연폭포와 함께 한국 3대 폭포의 하나이다. 대승폭포가 위치한 남설악지역 대부분은 중생대 백악기에 관입한 화강암류가 분포되어 특히 주변에는 인제와 원통, 양양을 잇는 단층선을 따라 발달한 폭포중의 하나로 성인별로는 단층 폭포, 유형별로는 수직낙하형 폭포에 속하며, 형성된 급사면과 단애에 크고 작은 폭포가 분포하고 암석들이 풍화작용과 침식작용을 받아 형성되어 수려한 경관을 보여준다. 폭포 맞은편 반석 위에 ‘구천은하(九天銀河)’라는 한자가 새겨져 있는데, 이는 조선시대 명필 양사언(楊士彦)의 글씨라고 전해지는 설과 헌종 3년(1837) 강원감사 홍치규(洪穉圭)가 썼다는 주장도 있다. 곡운(谷雲) 김수증(金壽增: 1624-1701)의 곡유연기(遊曲淵記), 김창협(金昌協: 1651-1708)의 동정기(東征記), 조선말기의 여류시인 금원 김씨(錦園金氏: 1817 ~ 미상)의 호동서락기(湖東西洛記), 조선후기의 문신인 해좌 정범조(海左丁範祖) 등이 설악산을 유람하며 대승폭포에 대한 경치를 극찬하고 있다. 대승폭포에 대한 한시(漢詩)로 이명한(李明漢: 1595~1645)의 寒溪瀑布 贈玉上人(한계폭포 증옥상인) 등 11명의 11수가 전해져 역사 경관적 가치를 높여주고 있다. Daeseungpokpo Falls, situated 740m above sea level and measuring 88m in height, are said to be one of the three greatest waterfalls in the Korean Peninsula, along with Guryongpokpo Falls at Geumgangsan Mountain and Bagyeonpokpo Falls in Gaeseong. 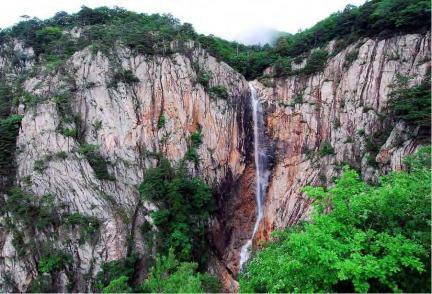 Most of the southern part of Seoraksan Mountain, where Daeseung Falls are situated, is covered with granite formed during the Cretaceous Period of the Mesozoic Era, and there are several waterfalls along the fault lines that connect Inje, Wontong and Yangyang. Among them, Daeseungpokpo Falls, which cascade down a steep rocky cliff, form a magnificent scene with the surrounding weathered and eroded rocks. Numerous travelogues and poems praising the waterfall’s great scenic beauty were penned by civil officials, scholars, and poets of the Joseon Period, including Kim Su-jeung (1624-1701), Kim Chang-hyeop (1651-1708), Lady Kim from Geumwon (1817-? ), and Jeong Beom-jo (1723-1801).